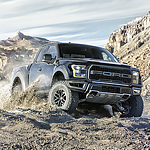 The Ford F-150 Raptor has designer exterior features that provide flair on the road. Along the front of the truck, you'll find a stylish grille that has a Ford icon stamped on the housing. This iconic Ford slab is mounted over multiple air pockets on the grille. These gaps make the overall grille design appealing, and they dramatically boost air circulation around key engine components because they're large and strategically spaced. On rough terrain, the tires on a Ford F-150 Raptor conquers tough obstacles with ease. Although the wheels have modern designer elements, they're engineered with strategic treads that boost traction and handling on off-road trails. Each tread has a deep channel that distributes mud and dirt away from a tire, and you can maintain the tread housing following off-road adventures by spraying the surfaces with a water-powered hose. Ford F-150 Raptor test drives are available, and you can take a cruise in one of these trucks by visiting Sheehy Ford of Springfield. We arrange test drives in various Ford F-150 trims for consumers.